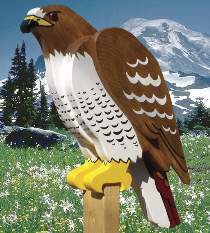 This Red Tailed Hawk will provide a watchful and protective presence. Perched on a post, this feathered guardian keeps an eye on your yard. Made from 3/4" and 1-1/2" stock. All patterns drawn FULL SIZE. The length from beak to tail is 22". Order one pair of brown eyes separately below.